But fashion indulges this stuff. It’s meek. It doesn’t seek to engage its audience because it looks down on its audience: “These proles have never seen a pretty dress before. They’ll explode with excitement when they see this one.” But you know what? They don’t. There’s no exploding, no excitement. At best, there’ll be one or two tagged shares (“Debbie Smith, this belt is kinda you.”). At worst, there’s complete and utter radio silence from the audience. And these aren’t tiddly little brands we’re taking about. 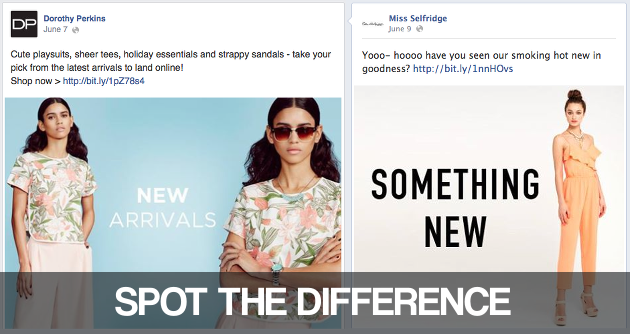 These are the high street big-hitters, retailers with hundreds of thousands, even millions of followers – all drabbing out the same blah, again and again and again. The brands we’re working with know that it doesn’t matter how many fans and followers you have. If you’re not selling to them in a meaningful way, then you’re just messing around on Facebook for a living. If you’re just posting pictures of your products and hoping people click through to buy, then you’re living in cloud cuckoo land. And you’re wasting an incredible opportunity. Fashion is the perfect sector for social selling but, to make a success of selling in social, you need to sell in a social way. Instead of foisting promotions on your audience, you need to give them a say – ask them what they want, then serve that back to them in a bold, imaginative way. Instead of just expecting people to share with their friends, you need to incentivise them – give them a deal which gets better as more people get involved, offer them rewards for being not just customers but marketers on your behalf. And, instead of linking to a common-or-garden, vanilla ecommerce store, you need to provide a social transaction – something they can do with their friends, together, which takes the communal spirit of the network they’re coming from and carries them all the way through to the checkout… and beyond. If you’re not doing that, then you might as well hire Hermione to post the same old stuff she posts on all your competitors’ social feeds. You probably already have.